Hi! 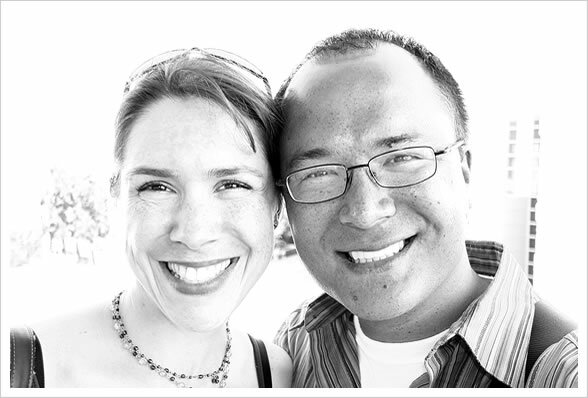 Welcome to our website, a photo album and journal for two inseperable lovebirds, John & Kristie. We enjoy living in the Pacific Northwest and sharing our experiences with family, friends, and kind strangers via the internet. Kristie is passionate about brain research, learning disabilities, and business management. She runs a successful independent insurance agency with her mom, and works with adolescents and teens as an educational therapist. You can learn more about her professional services at English Insurance Group (www.englishinsurancegroup.com) and Learning Landscape (www.learninglandscape.com). John is the primary photographer and author of the website. I enjoy hiking, traveling, design and photography. The photos were taken with a variety of equipment, including the Elph SD450, Powershot G3, Powershot G10, EOS 350D, and EOS 5D Mark II. I currently use the EF 14mm f/2.8L II, EF 24-105 f/4L IS, EF 50mm f/1.4, EF 70-300mm f/4-5.6 IS, and EF 100 f/2.8 Macro lenses. The Speedlite 420EX flash is often used indoors, stabilized with a Feisol CT-3441S tripod and a Photo Clam ballhead. Post-processing is via Lightroom and Photoshop.